The Penguins have been red hot in December, winning all five games they've played while playing a brand of hockey that would be more at home in the '80s or early '90s. They've scored an astounding 28 goals this month, good for a 5.6 goal per game average, and Saturday's 4-3 win over Tampa Bay marked their lowest offensive output on the month. They'll return home tonight looking to make it six straight against the worst team, the Arizona Coyotes. It's been a rough start to the season for a young Coyotes team. After bottoming out in 2014-15 with 56 points, Arizona saw a 22 point increase in the standings in 2015-16, finishing 4th in the Pacific Division with 78 points, they haven't taken the step forward they were hoping for so far this season, and their 23 points is tied for dead last in the entire league. Dylan Strome had high expectations heading into the season as the 3rd overall pick in the 2015 NHL Draft, but while Connor McDavid and Jack Eichel have excelled as the top two picks from that draft year, Strome has struggled so far to gain any traction professionally. After being relegated to juniors last season, Strome got a brief stint in Arizona with the Coyotes, but he managed only a lone assist in 7 games before being returned to the Erie Otters. Arizona has had a whopping 8 rookies for them dress already this early in the season: Strome, Christian Dvorak, Laurent Dauphin, and Tyler Gaudet at center, Lawson Crouse and Brendan Perlini at wing, and Anthony DeAngelo and Jakob Chychrun on defense. Though young, the Coyote rookies have a strong pedigree. Both DeAngelo (19th overall; 2014) and Chychrun (16th overall; 2016) are recent first round picks, and both defensemen have played well so far this season. Chychrun's 46.6 CF%, though low, compares favorably to his relative 44.2 CF% in addition to adding a goal and an assist in 20 games, while DeAngelo's 7 points (2g, 5a) in 12 games currently ranks him 3rd on the Coyotes with 0.58 pts/gm. Dvorak leads the rookies in scoring with 8 points (2g, 6a) after being selected in the 2nd round in 2014, while Crouse (11th overall; 2015) and Perlini (12th overall; 2014) are both high draft picks on the wing. In fact, the only member of the group who wasn't selected in either the 1st or 2nd rounds of the last three drafts is Gaudet, who went undrafted in 2011. It's similar to last season for the Coyotes, in which they had 4 rookies play in over 70 games for the team. While they got big years from Max Domi (18g, 34a) and Anthony Duclair (20g, 24a) last season, the two have trended in very different directions this year. Domi's numbers have mostly held steady this season even though the team is averaging roughly a third of a goal per game less this year, and his 11 assists are tied for the most on the team while his 16 points rank second. But in a major blow for the Coyotes, they'll be without Domi for six weeks after surgery on his hand. While Domi had been producing, Arizona hasn't been able to rely on Duclair like they thought they were going to be able to. After notching 20 goals as a rookie, Duclair is on pace to score just 3 goals in his sophomore campaign with just 10 assists. With just 4 points (1g, 3a) in 25 games on the season, Duclair has been a healthy scratch at times this season as he comes back down to Earth from the unsustainably high 19.0% he shot as a rookie. But while Arizona is young, they do have some veteran players leading the way. 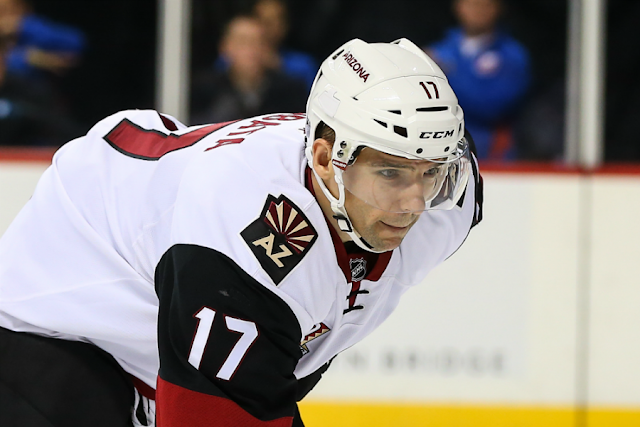 35-year-old Radim Vrbata leads the team in goals (8) and points (18). Though not old at 25, Oliver Ekman-Larsson is now in his seventh NHL season and leads the team in points from the blue line with 13. And captain Shane Doan at 40 years old is limping to the finish line in what should be his final season, having managed just 3 goals and 6 assists in 27 games.